It doesn't take the world's greatest detective to see that zombie games are popular. Left 4 Dead is a beloved franchise, The Walking Dead won a pile of game of the year awards, and DayZ became so popular that Bohemia Interactive is making it into a standalone game . All those games caught on because they took common concepts the zombie genre hadn't really done before (co-op, branching storytelling, and multiplayer survival, respectively) and executed them well. For 7 Days to Die, that concept is crafting. Your overarching goal in 7 Days to Die is one you've probably heard many times before—survive. But it's the way you survive that makes the game so promising. As a survivor in Arizona's rarely seen, non-Mojave Desert environment, you need to spend precious daylight scrounging for parts and scrap to use against the nocturnal zombie horde. 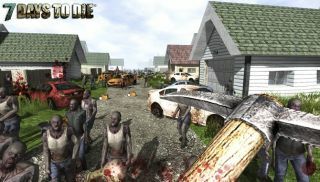 It sounds sort of like Minecraft but with more emphasis placed on zombie-killing rather than recreating other worlds. The game's website is also advertising a destructible, voxel-based world, online co-op and something called a "Dynamic Story Generation System" to get players to keep coming back. The pre-alpha trailer doesn't do the game's visuals any favors, but this isn't exactly a finished product ready for consumption—human or otherwise. The developer behind the game, the irreverently-named The Fun Pimps, have told us that they're using a business model similar to Minecraft where the earlier you buy, the less you pay. The first thousand people who plop $14.99 on the table will gain early access to the alpha build that's coming out sometime late July according to the developer The Fun Pimps. The rest will have to pay $29.99 for the chance to fulfill their post-apocalyptic engineering fantasies. The full game is expected to release sometime this October, though the developer told us that release date isn't set in stone. 7 Days to Die seems to be borrowing design qualities more than it is creating brand new ones, but that doesn't necessarily make it any less promising. Any game offering to add something new to the tired, over-populated zombie genre—even if you have seen it elsewhere—is more than welcome.